If you’ve been following Justin Martin for the past 12 months you’ll have noticed the fine form he’s currently in. Last year’s ‘Lezgo‘ with Ardalan appeared in plenty of best of ’2011′ lists whilst last week’s ‘Don’t Go’/'Rough Stuff‘ EP is already getting a lot of hype. All three of these tracks appear on his debut album Ghettos & Gardens. 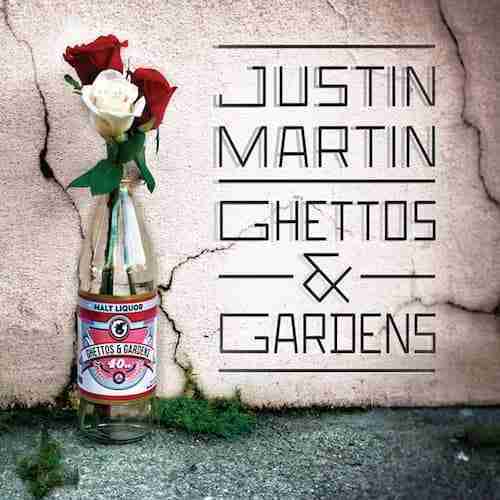 Ghettos & Gardens is Justin Martin’s marriage of melody and bass. Rather than being a ‘DJ album’ of club tracks connected by unnecessary filler he has created an album’s worth of songs that stand up equally to home listening and club play. ‘Don’t Go’ takes a beautiful harp sample and underpins it with a tough bass line making it a joy to listen to but also extremely powerful. ‘Hood Rich’ intersperses emotive strings with low end wobble. ‘Kemistry’ slows down Goldie’s original, giving the lush vocal and synths space to breathe before breaking into a disgustingly aggressive throb. Throughout Ghettos & Gardens Justin Martin blends delightful musicality with speaker shaking bass all tied together with slickly produced beats. It’s a surprisingly playful piece of work, something that a lot of producers fail to capture. It’s hard to listen to this album without a wry smile slowly and subconsciously spreading across your face. That’s not to say it’s silly, childish or even humorous but you can’t imagine Justin Martin taking himself too seriously and that reflects well here. It’s as much an album of sunshine and friends as it is of tough beats and bass in dingy clubs. Every so often it’s nice to be reminded that electronic music can be a heck of a lot of fun. Justin Martin’s debut makes for an extremely satisfying listen, it fulfils the needs of both the ears and the body, the brain and the feet. Ghettos & Gardens exerts a confidence, safe in the knowledge it’s not trying to be something it isn’t. It’s not pushing too many envelopes or needlessly re-inventing the wheel again, it’s just good music done well.